Interesting piece at ScotlandsPeople about popular names in Scotland. Link is http://www.gro-scotland.gov.uk/statistics/theme/vital-events/births/popular-names/archive/forenames-1900-2000.html but here are some salient snippets. In 1900, the top five names were given to 50% of boys and 38% of girls. 13.2% of boys were called John and 11.7% of girls were called Mary. If you have Scottish ancestors I bet you have all the top 10 names from 1900 on your tree. I do, although not many George, David, Andrew and Charles for boys. Interestingly, James and Andrew are the only names to stay the course, although Jack is a form of John and of course Jamie is a form of James. The top three surnames in Scotland are Smith, Brown and Wilson, and 1 in 8 surnames begin with Mc or Mac. Surnames developed slowly and had regional differences. Therefore “similar, or in some cases identical, surnames have been derived from entirely different sources and different areas of Scotland. Thus the modern ‘consistency’ in naming conventions has been based on a possibly ‘inconsistent’ starting point. In other words, to rely on surnames as a guide to family history becomes less reliable the further back in time the researcher goes.” I have long suspected that my Strachan ancestors have nothing to do with the Strachans of Kincardineshire and although the names now share the same spelling, the original derivation is quite probably very different. Nobles and landowners were the first to acquire surnames and were frequently named after the land they owned. The name was then taken up by others who came from that place. As there were many places sharing the same name, this resulted in the same surname developing in different locations but with no relationship to each other. If people moved, they may well have changed their surname. The article gives details of frequency of Scottish surnames, plus links to tables which show frequency of surnames in particular regions in 1901. In 1901, Fraser was the 10th most frequent surname in Aberdeenshire: the only other areas it appears in are 1st in Nairn, 2nd in Elgin and Inverness and 10th in Ross & Cromarty. This sort of proves my feeling that my Frasers originated from further north than Cruden. Strachan doesn’t appear on any of the lists, so it’s not that widely a used surname. This is an academic book based on the author’s PhD thesis, and is also now out of print but I managed to find a secondhand copy. 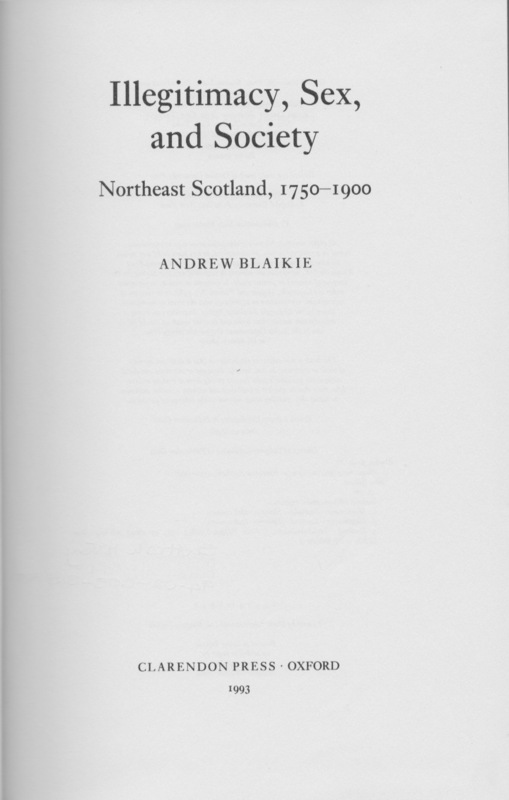 Worth looking for in a library if you have ancestors who were farm servants, ag labs and crofters in Banffshire or Aberdeenshire. The illegitimacy rate in that part of Scotland was much higher than in other parts of Scotland, and this book is an exploration of the reasons why that might have been, based on a very through analysis of parish registers and census data. In 1855 the overall illegitimacy rate for Scotland was 7.8% but in the northeast it was 13.0%. My Fraser family, from Cruden parish, did their best to contribute to that figure, which is why I was drawn to this book. 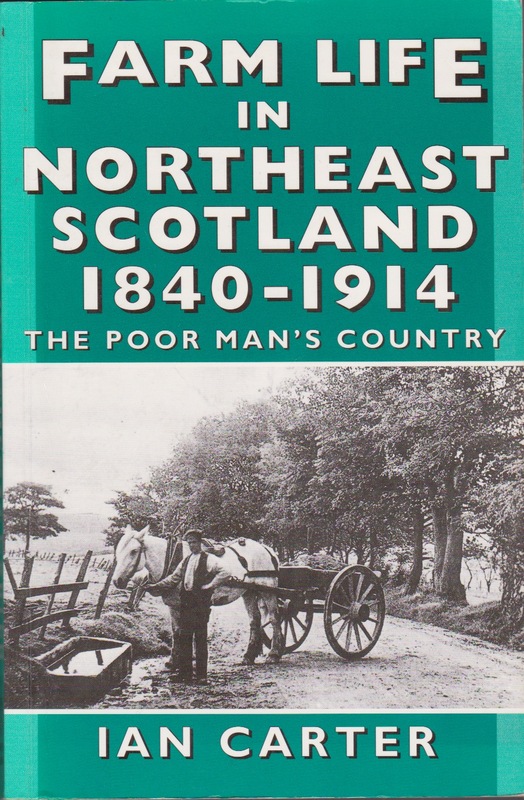 A good book to read if you want to know about the working lives of farm servants, agricultural labourers and crofters, and especially those who lived in Aberdeenshire and neighbouring counties. Takes a sociological stance and is an academic book, but gives a very thorough account of a lost way of life. Very good on the social relationships and “class” structure of farming communities, and the working lives of farm servants. Excellent bibliography for further reading. Thought I’d mention a few web sites I’ve found excellent for padding out the detail of my Scottish ancestors’ lives. National Library of Scotland’s digital gallery – access point to historical maps of Scotland, Post Office directories, gazetteers of towns and parishes, plus lots of other fascinating stuff. Statistical Accounts of Scotland – a very good read to get a feel for where your Scottish ancestors lived. The Old Statistical Reports were published in 1791-1799 and the New Statistical Reports in 1834-1845. Access to Scottish historical tax rolls from 1645 to 1831.